Now that I’ve had my interest sparked in the Seven Years War (SYW) period, I’ve been doing some homework. For background, a lot of people point to the outstanding Wiki-style Kronoskaf SYW Project website for more than 2200 articles and 5500 pictures relating to the period. I’ve found the maps collection to be particularly compelling since I have a huge interest in how landscapes shape warfare in all periods. I’ve also laid out a small initial investment on the very popular Warfare In The Age Of Reason rulebook written by Tod Kershner and Dale Wood, published by Emperor’s Press and available at On Military Matters. I also found a Facebook page dedicated to the rules which I plan on using for visual inspiration and gaming information in the coming months. At some point, tracking down a copy of the out-of-print Uniforms of the Seven Years War 1756-63 by John Mollo and Malcolm McGregor sounds like thing to do if I want a collection of handy plates on my bookshelf. Fortunately there are a few players at Metropolitan Wargamers in Brooklyn, NY who already have pretty sizable collections of SYW 15mm miniatures from a represenative cross-section of period armies. 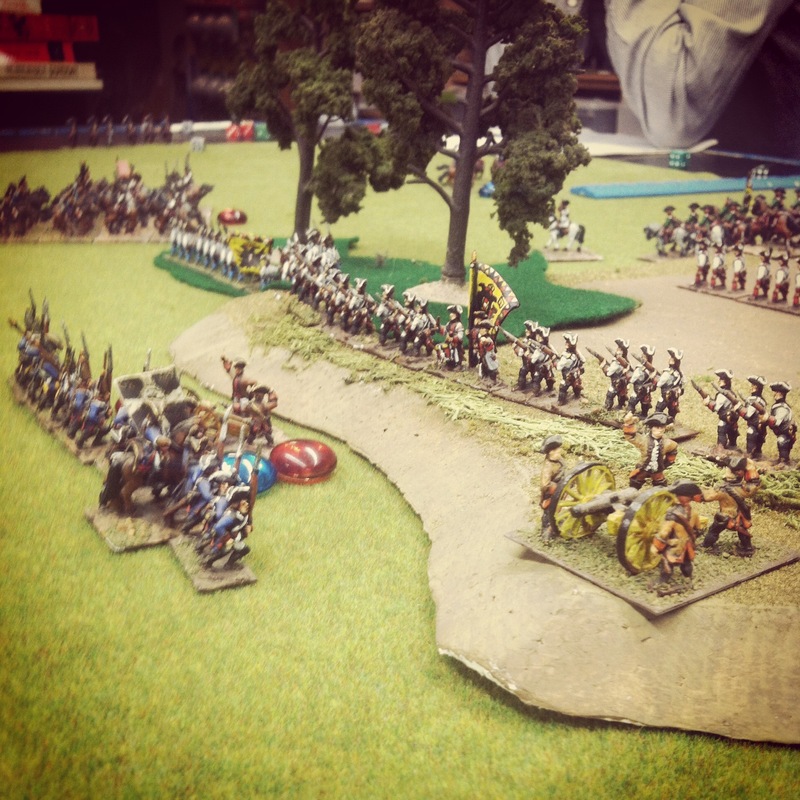 Some guys at the club also have figures from the period in 28mm, and one of the newer members is talking about running a campaign-style SYW game next year. 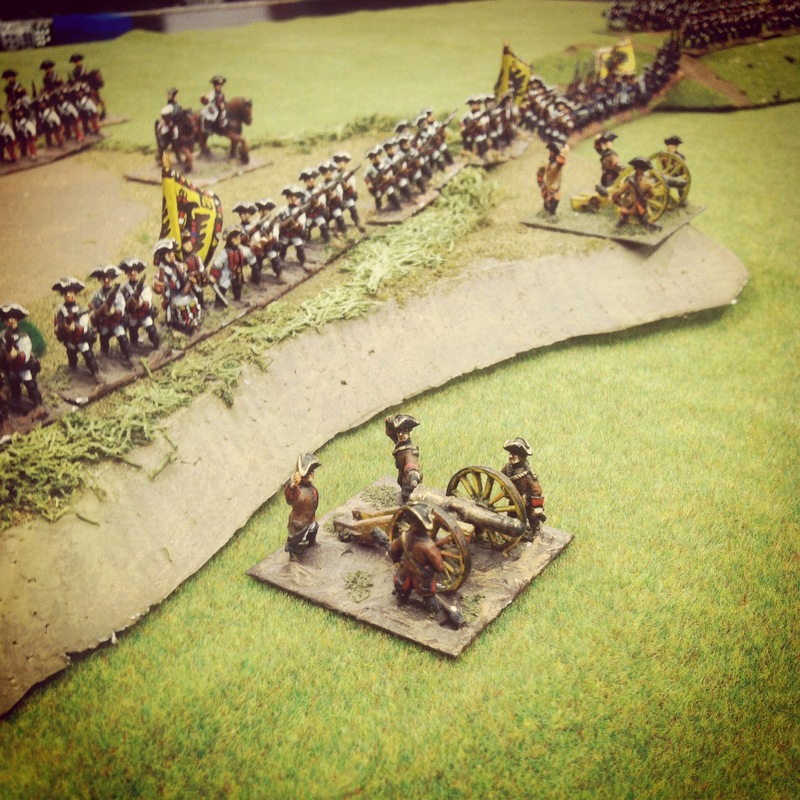 Even with models at the ready for gaming at our club, I’m already eyeballing the 18th-century 15mm figures available from Old Glory Miniatures and Essex Miniatures as one of my projects for 2014. 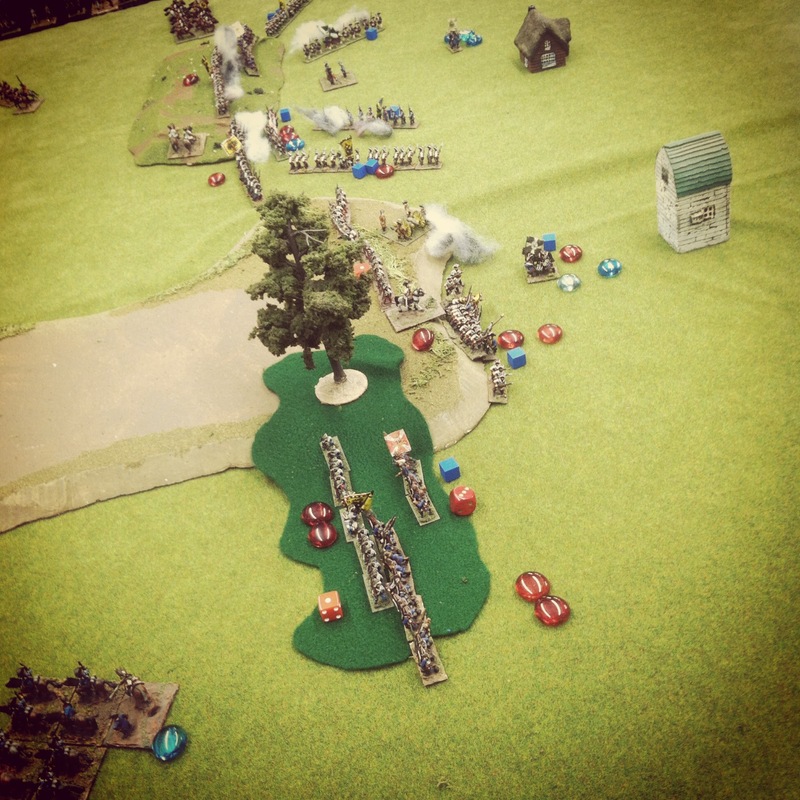 This past weekend, my son and I got together with some club members in Brooklyn for another SYW game, this time the Battle of Kolin June 18th, 1757. 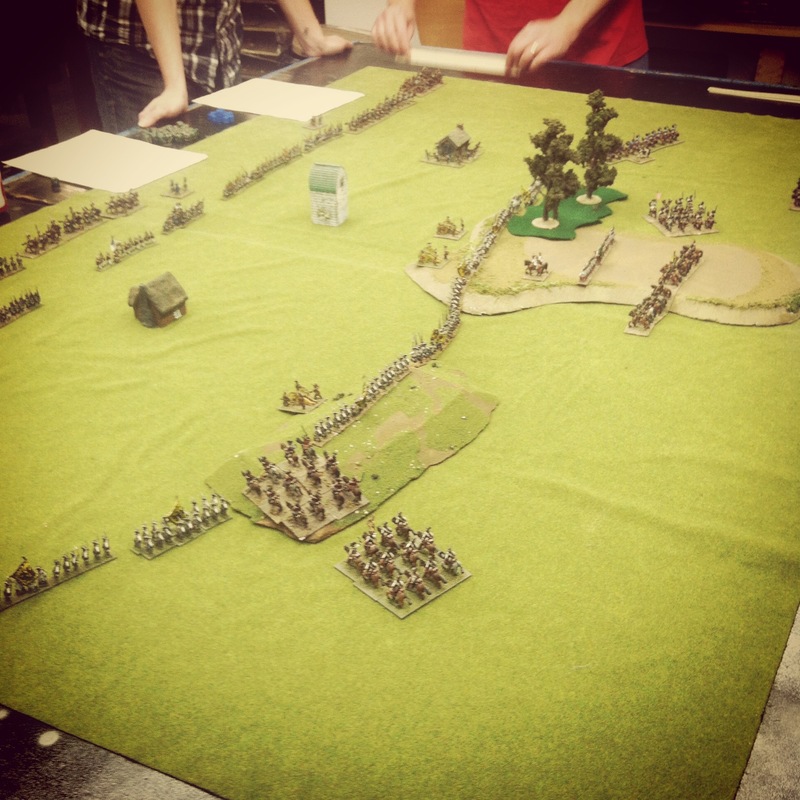 The battle came a couple months prior to our previously-played scenario of Moys from September 1757, and proved to be the first defeat experienced by King Frederick II of Prussia. 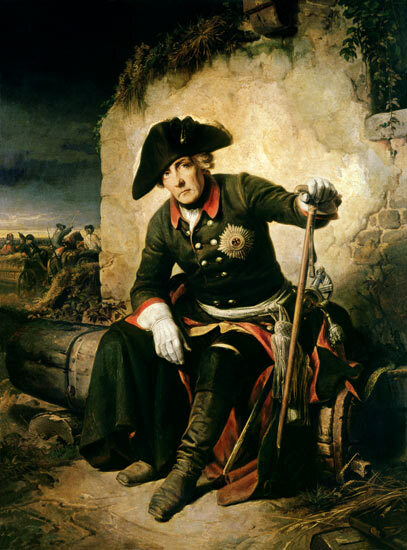 Admired by contemporaries and scholars today as one of the greatest military leaders in history, Frederick The Great and his Prussian forces were viewed at the dawn of the SYW period as the greatest standing army in Europe. Aligned with Great Britain and surrounded by Austrian-aligned adversaries on the continent, Frederick’s tactical innovations led his often outnumbered forces to numerous victories. At Kolin in the present day Czech Republic, Frederick led some 34,000 Prussians in a march hoping to destroy the Austrian army seeking to reinforce the besieged city of Prague. Unfortunately for Frederick, he chose to confront the superior force of 44,000 Austrians on their home turf defending from the rolling hills near Kolin. 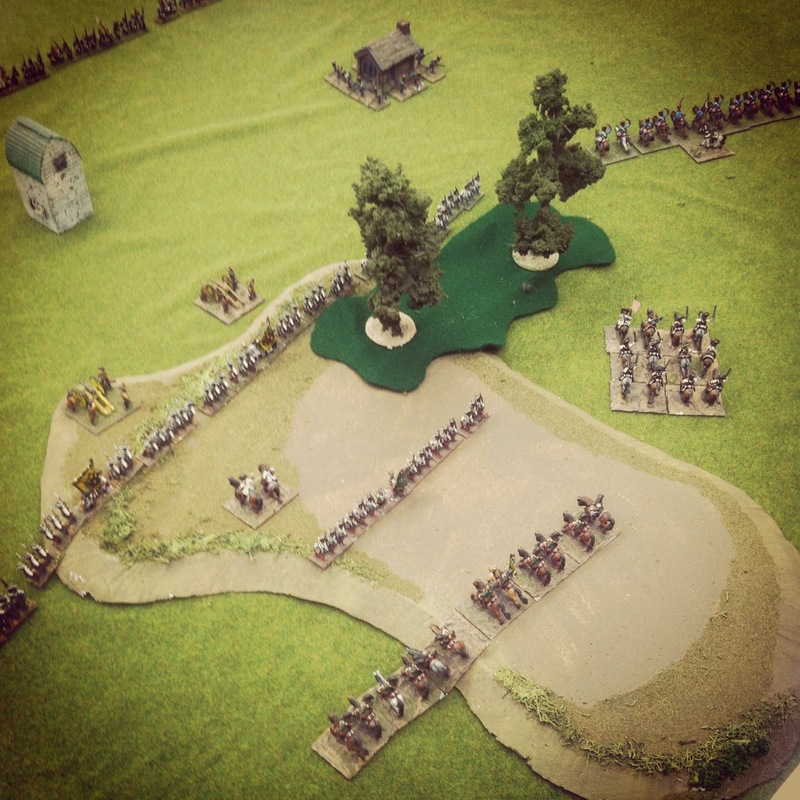 On the hot summery day in June, Frederick’s aggressive gamble would result in his undoing. Our battle started historically with the Austrian infantry aligned across the defending hills, three heavy gun batteries at the center and cavalry to either end of the line. 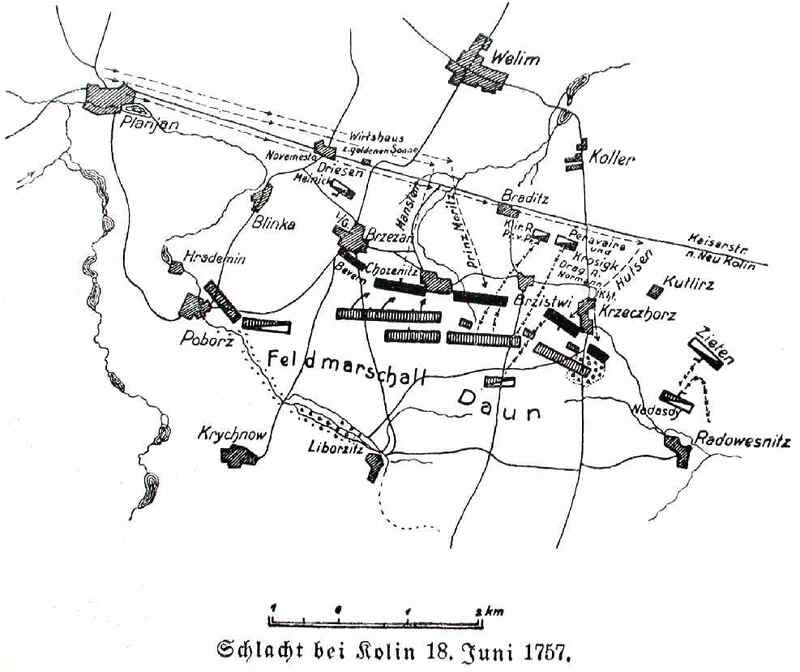 The Prussian advance began with a cavalry push on their left around a small town held by Austrian allied skirmishers. Frederick, near the center of the line, began a slow and cautious march to the hill objectives toward the center. 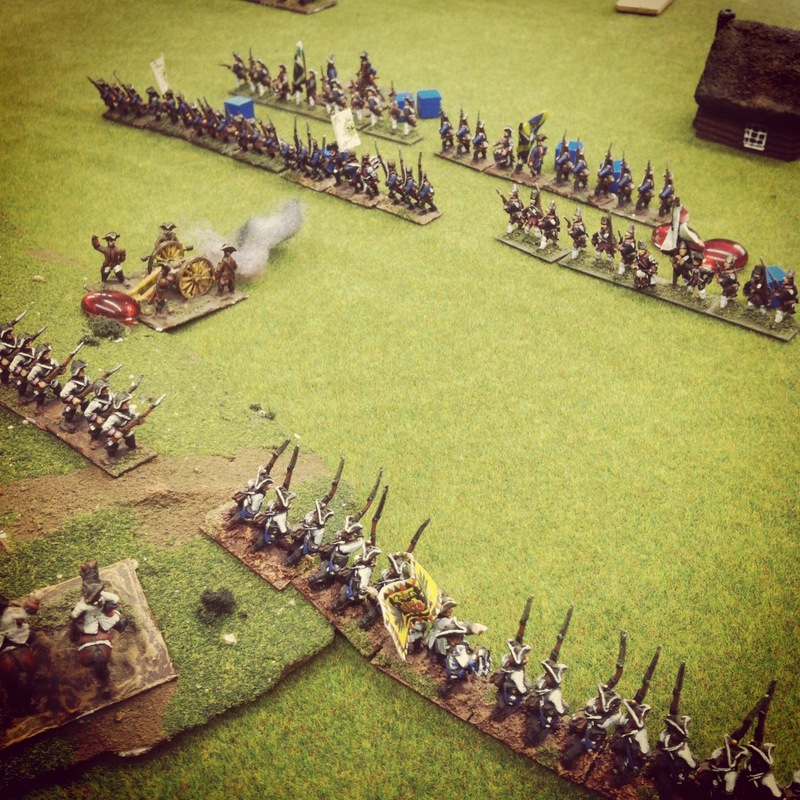 On the Prussian left, a cavalry charge was met with a counter charge from the Austrian-aligned Hussars. 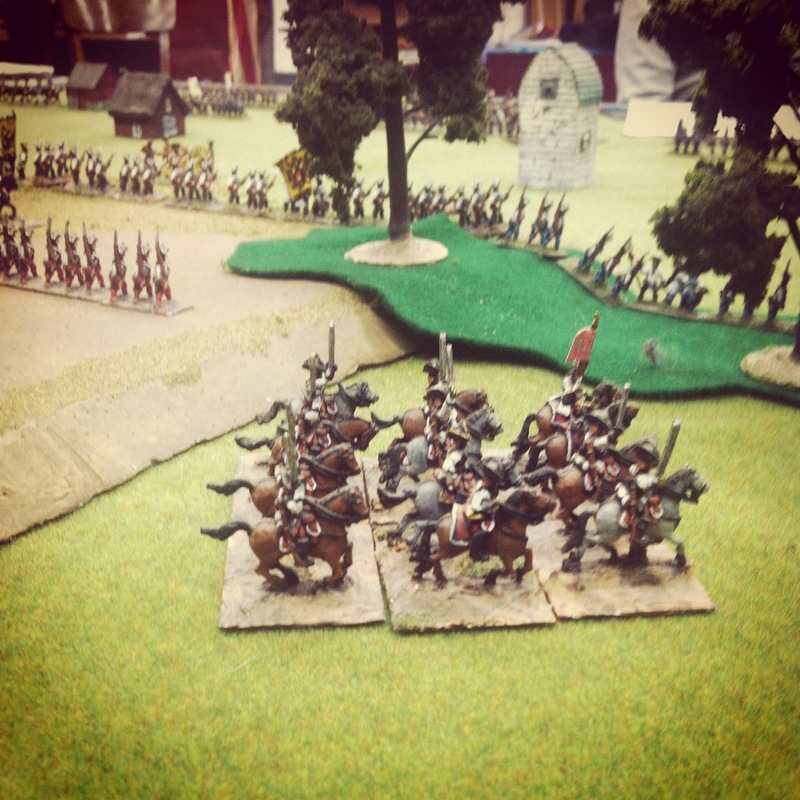 Nearby, Austrian line infantry advanced in the hopes of driving skirmishers out of the nearby town. If the initial Austrian press worked, the entire Prussian right flank would fold. As the Hussars folded under the attack and retreated in disorder, Austrian heavy cavalry charged back toward the advancing Prussians. With the Prussian charge repulsed with losses on both sides, the Austrian cavalry now looked to turn the Prussian left flank with more heavy cavalry rushing from the rear. 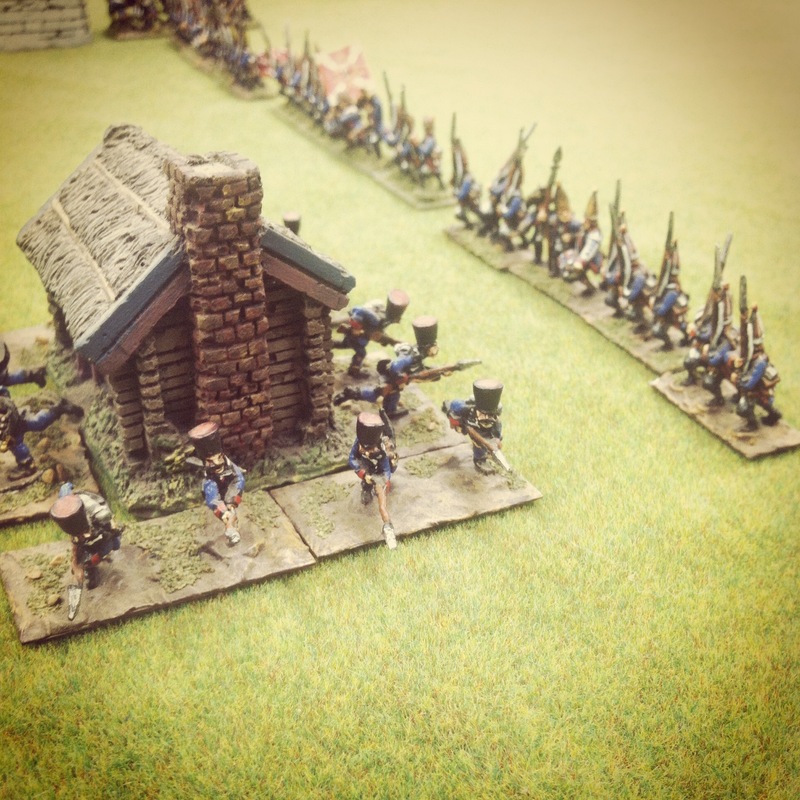 At the center of the table, the Austrian lines held their ground and pulled into the nearby woods to defend against the coming Prussian advance. As Prussian infantry advanced several lines deep, they were met with several turns of cannon fire yet continued their press forward with Fredrick attached at the rear. If you listened carefully, I think you could hear Fredrick’s famed shout of “do you want to live forever?” echoing from the tabletop as he urged his Prussians onward. 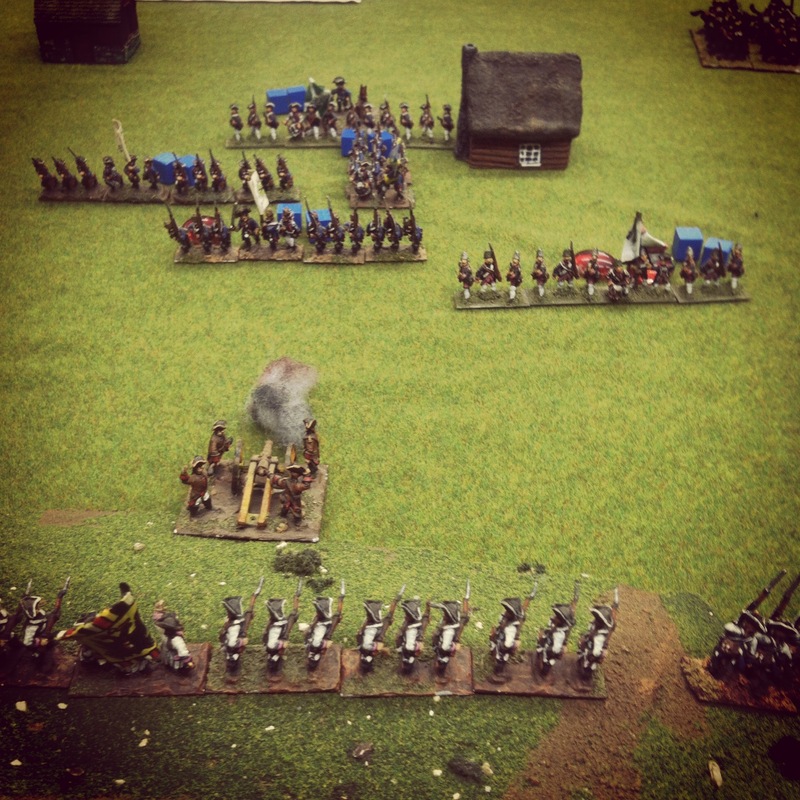 Eventually, the overwhelming force of the Prussian lines closed on the Austrian batteries at the front of the line. One battery was destroyed and a second fled the field following a charged assault. With Austrian infantry now staring down from on the hill, the Prussians marched uphill to their objective and closed within charge distance. 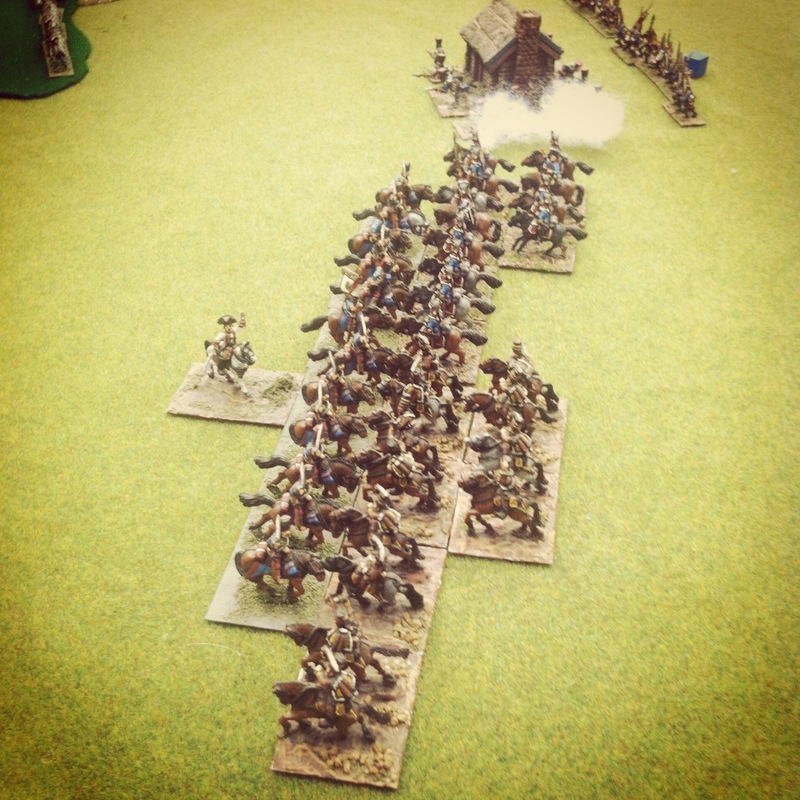 A charge and counter charge locked lines in melee in the woods at the Austrian right as Prussians pressed their advance now all along the line. On the center hill, an Austrian line wheeled down the hill to envelope the Prussian lines in fire both to the front and at their flank. The one remaining Austrian battery continued to pummel the Prussian lines scrambling for the center hill. 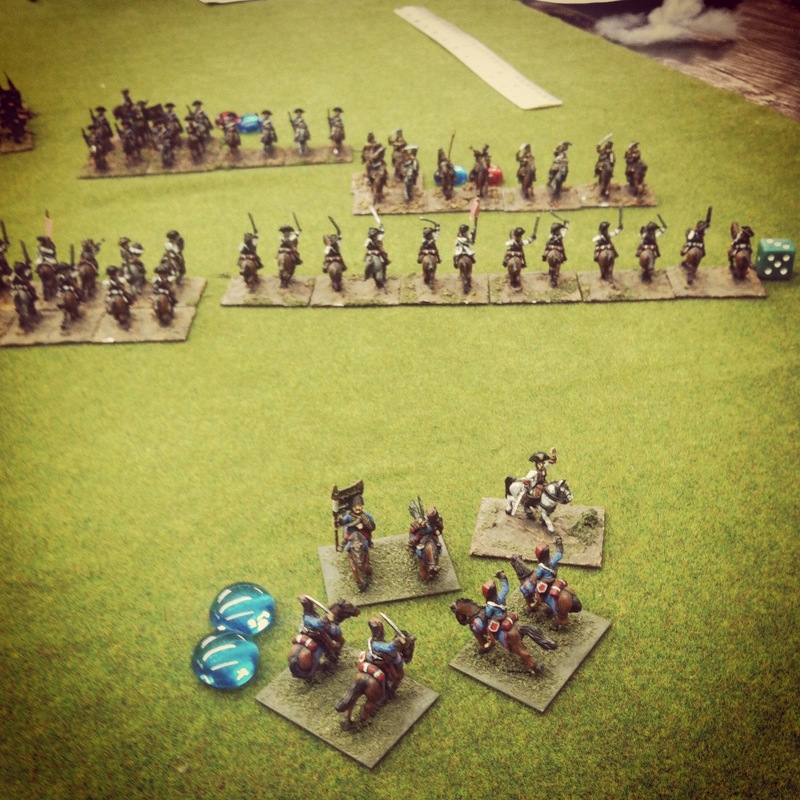 On the far hill on the Austrian left, lines finally made a move on the Prussians. With the cavalry charges at a stalemate on the Austrian right and the Prussian lines split into two losing combats at the hills, the Prussians failed a morale test under heavy losses and ceded the field to the Austrian army. Once again, Frederick’s gambit at Kolin had resulted in defeat. After two games in the Seven Years War period in as many weeks, I’m hooked on the era. 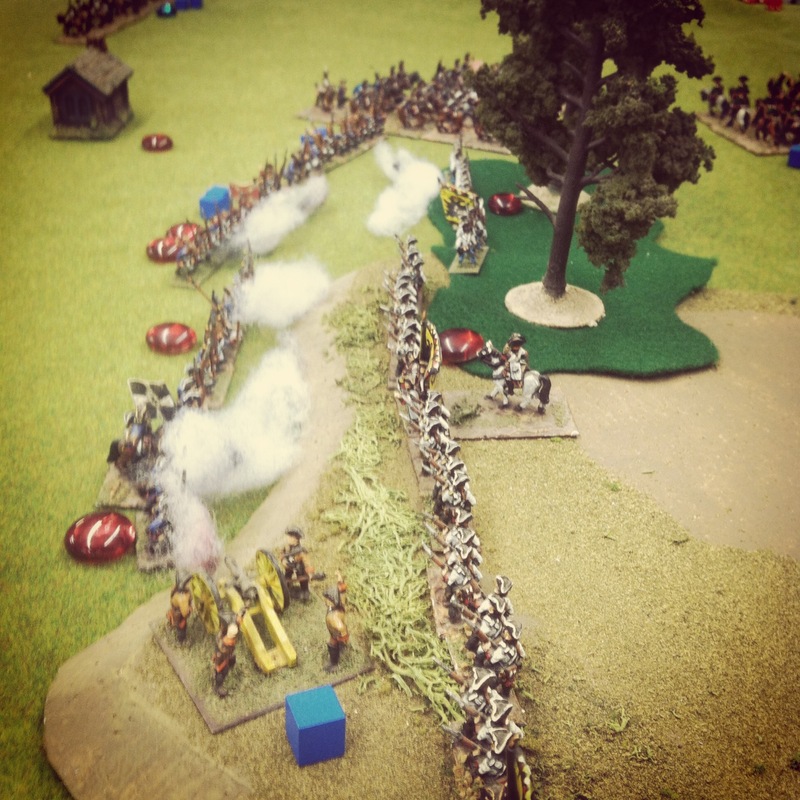 The games begin cautiously with slowly-deployed movements but quickly erupt into vicious volleys of fire, swift charges and hand-to-hand combats. Even with thoughtful strategic planning at the outset, the battles quickly evolve into chaotic back-and-forth tactical blood baths. The constant morale checks as the battlefield shifts and fire is taken becomes as much a path to outcome as men falling on the field. 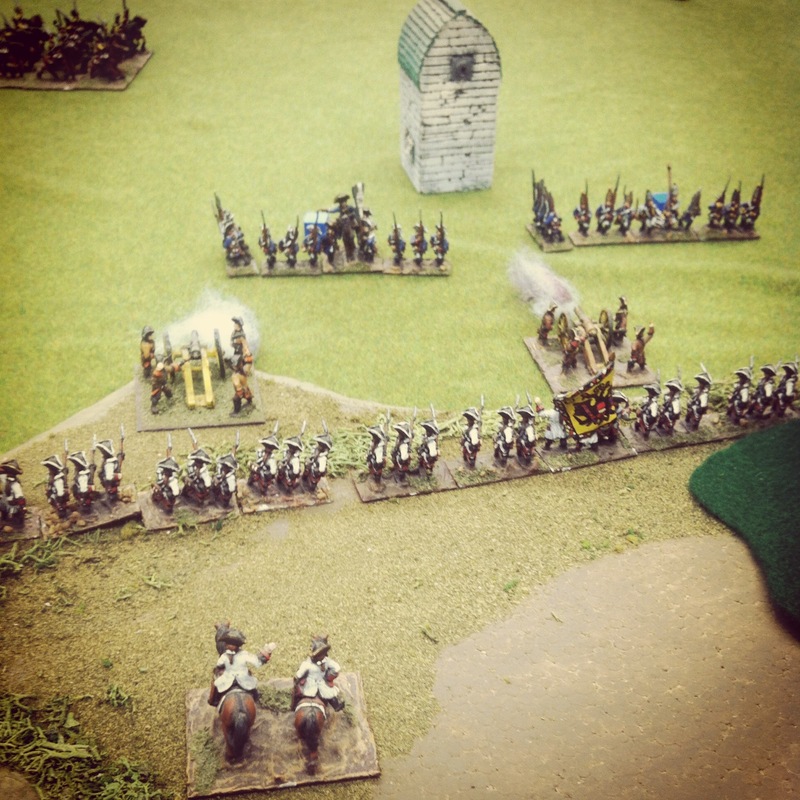 And, as with the original battle at Kolin, the Austrians defenders proved to be too much a match again for the Prussian invaders this past weekend.